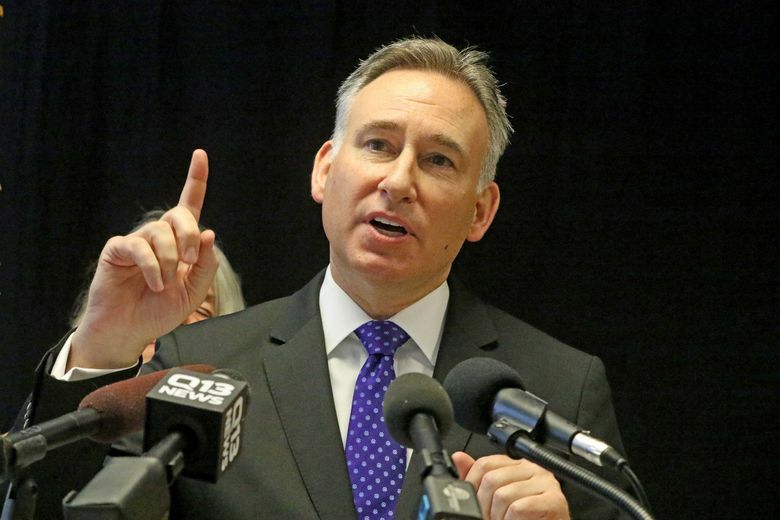 King County Executive Dow Constantine is proposing to triple the size of the Veterans and Human Services Levy to increase affordable housing and add services for seniors. King County Executive Dow Constantine on Monday proposed tripling the county’s Veterans and Human Services Levy when it expires in December. The new levy, which would add programs for the county’s seniors, would raise about $60 million in the first year and $400 million over six years. The current levy raises about $18 million a year. If approved by the County Council, the levy would go to voters in the November general election. A King County homeowner would pay 12 cents per $1,000 assessed value, or $4.50 per month for a $450,000 median-priced home, up from $1.50 per month for the current levy. Included in the executive’s proposal would be an exemption for low-income seniors and disabled veterans. “People in this community recognize that serving our veterans, domestic-violence victims and seniors is a core responsibility, and I think they are willing to pay a few dollars per year to do that,” King County Executive Dow Constantine said in an interview. The Veterans and Human Services Levy has faced almost no opposition since it was first approved by voters in 2005. It was renewed in 2011 with 66 percent support. A principal goal of the levy is to address homelessness among veterans, who make up about 10 percent of the county’s homeless. Since 2006, the levy has contributed to the creation of more than 2,000 units of affordable housing and has helped thousands of chronically homeless veterans and other people move into housing, according to county statistics. County officials say the levy has saved at least $7 million since 2012 in jail and emergency-room costs by providing housing, health care and substance-abuse treatment through a levy-funded database and housing-placement program. But the levy-renewal proposal comes in the midst of a number of other tax increases. Voters are still smarting from the unexpectedly high car-tab fees and additional sales tax that kicked in April 1 to help pay for the regional expansion of Sound Transit. The Metropolitan King County Council earlier this month approved placing a 0.1 percent increase in the sales tax on the August primary ballot to fund access to arts, culture and science programs for families and children. That measure, if approved by voters, would raise $67 million per year. Constantine and Seattle Mayor Ed Murray have also discussed a levy to fight homelessness that could be submitted to voters in 2018. That also would be funded with a 0.1 percent sales-tax increase and raise $67 million per year. Constantine said the county will seek help from the state Legislature to exempt low-income seniors and the disabled from the levies. Besides tripling revenue from the current Veterans and Human Services Levy, the latest proposal would for the first time include services for the county’s growing population of seniors. By 2030, their numbers are expected to double to 400,000, or about 18 percent of the county’s population. Meanwhile, county leaders note, funding for seniors from government and philanthropic sources has declined. King County’s Area Agency on Aging reports a $3 million funding reduction over the past five years while it has attempted to serve 12,000 new senior clients. In 2015, United Way cut funding for seniors in both King and Snohomish counties, including support for the popular Meals and Wheels program, in order to focus on addressing poverty and homelessness. County leaders say the levy’s investment in affordable housing also would help reduce the number of seniors who may be priced out of their homes by rising rents and taxes. The levy would also add programs to help seniors remain active and healthy, and avoid social isolation. Additionally, the levy would continue to help domestic-violence survivors and other vulnerable people find and maintain housing and mental-health treatment.